The WIPO Economic Research Working Paper Series includes economic and statistical studies that are the outcome of professional research. Such research may be conducted in preparation of WIPO reports or as part of self-standing analytical projects. The papers included in this Series typically report on research in progress and are circulated in a timely manner for discussion and comment. The views expressed in them are those of the authors and do not necessarily reflect those of WIPO or its member states. This working paper aims to present the specifics of innovation in the Polish health industry through the prism of the experiences and opinions of a representative group of 42 companies from both the pharmaceutical and medtech sectors. Through analysis of in-depth interviews, it aims to illuminate the legal, economic and social mechanisms and phenomena that determine innovation in this sector. The survey examines which areas of the Polish health sector are most innovative, the understanding of innovation that prevails in the sector, and the characteristics of R&D activities carried out there. Subsequently, the study explores the general impact of intellectual property, and particularly of patent law on innovation, in the Polish health sector. Finally, it surveys the other economic and legal instruments currently stimulating innovation and how legal regulations and governmental policy could be modified to create an optimal pro-innovation environment. The conclusions include short legal and factual background of innovation in the Polish health sector, the summarized results of the conducted analysis and final comments concerning the level and culture of innovation within the examined industry. The economic consequences of migration are hotly debated and a main topic of recent political movements across Europe. We analyze Polish immigration in the context of the 2004 enlargement of the European Union and find a positive and significant spillover effect of the immigrants on the number of local inventors in German counties in 2001-2010. For causal identification, we exploit a historical episode in the Polish migration history to Germany before the fall of the Iron Curtain and construct a shift-share instrument. Our results differ from findings for high-skilled migration to the United States, which is particularly interesting as Polish immigration to Germany was not based on selection by qualification in our period of analysis. Companies use trademarks to protect their brands from outright imitation or competition by confusingly similar products. However, publication of trademark filings by the trademark office discloses information about a firm’s new product or service. This creates a trade-off between legal protection and disclosure of information. We analyze the trade-off through the lens of “submarine trademarks” in the U.S. – submarine trademarks are trademarks whose publication and hence disclosure to the public is strategically delayed. This is achieved through a particular international filing strategy that is often combined with the use of shell companies to further conceal the trademark filing. These submarine strategies allow companies to benefit from legal trademark protection while reducing the risk of inadvertent disclosure of information. We provide the first systematic evidence of submarine trademarks and explore both their determinants and their effectiveness in reducing the disclosure of information. The stereotype of the “starving artist” is pervasive in modern Western culture, but previous research on artists and income is mixed. The goal of this study is to explore how several demographic variables, along with self-reported behaviors and artistic activities associated with non-monetary and monetary motivators, predict income and income satisfaction for artists.Using unique survey data on current working artists in the United States, we provide empirical evidence on substantial reputational rewards and rewards from altruistic behaviors as important sources of artists’ utility and, arguably, sources of their motivation to create new works. Moreover, we find that the evidence on “procedural” utility from working in the arts is less straightforward, and we find that many artists are pooling and diversifying financial risks on household levels. Overall, quantitative findings indicate that artists may have different criteria and conceptualizations when it comes to income, and they may derive value from their work in a variety of ways aside from income. The digital transformation imposes both opportunities and risks for creativity and for creative employment, with implications for trends in income levels and the distribution of income. First, we consider skill-biased technological change as a determinant of income and labor market outcomes in the arts. Arguably, the IT revolution has changed the demand for certain skills, with creative occupations being more in demand than general employment. Second, we consider declines in the costs of generating new works and artistic experimentation due to digital technologies, and their effect on the barriers to entry in labor markets. Third, we touch upon the rise of online contract labor in certain creative professions as a determinant of income. Here, online platforms can change creators’ access to work opportunities and it may alter the way income is distributed. We find that wage trends for creative workers in the digital age outperform general trends in the population: based on various data sources and various ways to identify creators, we see creators losing less or even gaining a better income position in relative terms. From a policy perspective, results do not lend support to the idea that creators’ income situation has systematically worsened with the rise of the internet and its intermediaries. Evidence on changing distributions of income is ambiguous as trends differ from one country to the next. Enforceability of patent rights is the backbone of the patent system. We review differences in the way patent litigation systems are designed across jurisdictions. We also discuss challenges in collecting and accessing patent litigation data as well as their economic analysis. We provide some descriptive analysis of patent litigation in the U.S. and UK for the period 2010-2016 and 2007-2013, respectively. We also analyze administrative post-grant validity challenges in form of the inter partes review in the U.S. and oppositions at the EPO. This paper analyzes the recent economic and innovation trends of the health industries in Poland. The health industries have observed remarkable growth since entering into the EU. While the pharmaceutical industry faces some economic slowdown since 2011, the medtech industry shows substantial dynamism for its small size. The Polish health industry has still much to do to improve its innovation status. However, the observed trend of the innovation dynamics is cause for optimism. Polish firms in the health industries are increasingly innovating and extracting economic results from these innovations. We analyze inventions in green energy technologies over the period 2005-2017. We use a novel dataset, making use of the IPC Green Inventory of the World Intellectual Property Organization (WIPO) to analyze four broad categories of green energy technologies including alternative energy production technologies, energy conservation technologies, and green transportation. We use these data to look at how patent families and PCT international patent applications have evolved in this field in recent years. We find that energy innovation-related patenting has first expanded exponentially up until 2013, both in terms of the total number of patent families and PCT international patent applications in green energy technologies. Yet this period of accelerated growth in the number of published green energy patents has been followed by a period of deceleration—even a slow decline. Although most green energy technologies have seen a downward trend in the annual number of patents published since 2012, the decline has been most pronounced in nuclear power generation technologies and alternative energy production technologies. The latter notably include renewable energy technologies, such as solar and wind energy, and fuel cells. In contrast, patents in energy conservation technologies and green transportation technologies have continued to grow, but at a slower pace. We analyze the use of intellectual property (IP) by firms in Chile over the decade 1995-2005 as the then middle-income country experienced rapid economic growth of 4.7 percent per year. We use a novel dataset that contains a combination of detailed firm-level information from the annual manufacturing census, information on firms’ innovative activities from Chile’s innovation surveys, and firms’ patent, industrial design, and trademark filings with the Chilean IP office. We use these data to look at how IP use by companies has changed over time and analyze the determinants of IP use, in particular first-time use. We find that sales growth prompts first-time use of patents and trademarks, though such use does not change the growth trajectory of firms nor does it improve their total factor productivity. We also find that trademark use is associated with new-to-the-world product innovation, which suggests that branding may be an important mechanism to appropriate returns to innovation in a middle-income country like Chile. Uganda's innovation performance in recent years has consistently outpaced other low-income and Sub-Saharan African countries. Though encouraging, this nascent progress will only benefit the broader Ugandan population if policy makers address specific constraints in the innovation systems of the critical agri-food sector, which is hampered by low productivity and profitability. In this report, we explore these constraints using an agricultural value chains framework with particular focus on the Robusta Coffee Planting Material Pipeline and tropical fruit processing. This report uses data on individual smart phones as well as industry data to identify which smartphone firms capture the most value. It finds that Apple captures most of the industry profits, thanks to its high prices, large profit margins and the volume of iPhone sales worldwide. Apple’s success is explained as a result of its ability to develop its own intellectual property (IP) and take advantage of IP created by suppliers through a strategy of selling only a few models at high prices compared to competitors. China dominates the global solar photovoltaic (PV) value chain, while 15 years ago the demand and supply were located in few Western economies. In this process, the PV industry has seen a booming demand, drastic price decreases along the supply chain, and fierce competition among surviving companies. This paper seeks to understand how this spatial shift has occurred and its drivers, with a specific focus on the role of intangible assets and intellectual property. The paper describes: a) the coffee industry and its GVC structure; b) the role that intangible assets play in value creation from both the supply and demand perspective; and c) the current and potential role of intellectual property tools in creating and retaining value, as well as providing economic upgrade options. Transactions involving intangible assets within multinational enterprises impose challenges for national economic accountants. In light of the challenges, recent research at the United States Bureau of Economic Analysis aims to identify areas for improving the treatment of multinational enterprises in national economic accounts. This paper summarizes the work and demonstrates implications for gross domestic product – the most widely cited measure in national economic accounts – of the United States. Today’s production processes are fragmented across countries and industries. Intangibles play an important role, but their measurement is elusive. This paper proposes a new empirical framework to measure factor incomes in production that spans industries and countries. Research and development (R&D) activities of emerging countries (EMEs) have increased considerably in recent years. How important are knowledge transfers from developed countries and other emerging countries? This wide-ranging but rigorous macro-level study of 31 EMEs provides some much-needed evidence. This paper presents an empirical approach to identifying and ranking the world’s largest clusters of inventive activity on the basis of patent filings. Patent data offer rich information on the locality of innovative activity. Many researchers have already made use of these data to study individual clusters or selected clusters within a particular region. Our approach goes beyond existing work by identifying and ranking innovation clusters on an internationally comparable basis. This paper analyzes the gender of inventors in international patent applications. We compile a worldwide gender-name dictionary, which includes 6.2 million names for 182 different countries to disambiguate the gender of PCT inventors. Our results suggest that there is a gender imbalance in PCT applications, but the proportion of women inventors is improving over time. We also find that the rates of women participation differ substantially across countries, technological fields and sectors. There has been a concomitant rise in R&D and the rate of economic growth in emerging countries. Analyzing a panel of 31 emerging countries, we find convincing evidence of scale effects which make government policies potent for long-run growth. This contrasts sharply with the well-known findings of Jones (1995a). Innovations show increasing returns to knowledge stock, implying that the diminishing returns assumed by some semi-endogenous growth models might not be generalized. International R&D spillovers raise the innovation bar. The observed growth rates of emerging economies appear in transition therefore their growth rates may recede with the passage of time. There is a growing interest in broadening the measurement scope of innovation and considering “creative” activities, meaning that the usual indicators of innovation satisfy neither scholars nor policy makers. Conceptually, there is not much difference between innovative and creative activity: but to what extent are current measures that capture innovation relevant for creativity? Can the new measures for creativity benefit from the experience accumulated through R&D and innovation? Our article provides insights and lessons learned from using measures of innovative activities for scholars who are interested in capturing creative activities. We underscore the difficulties faced when measuring innovation and draw some parallels of these difficulties with the efforts undertaken to measure creativity. Robotics technology and the increasing sophistication of artificial intelligence are breakthrough innovations with significant growth prospects and the potential to disrupt existing economic and social facets of everyday life. Few studies have analyzed the developments of robotics innovation. This paper closes this gap by analyzing how innovation in robotics is taking place, how it diffuses, and what role intellectual property plays. This paper examines the role of intellectual property and other innovation incentives in the development of one field of breakthrough innovation: nanotechnology. Because nanotechnology is an enabling technology across a wide range of fields, the nanotechnology innovation ecosystem appears to be a microcosm of the global innovation ecosystem. Part I describes the nature of nanotechnology and its economic contribution, Part II explores the nanotechnology innovation ecosystem, and Part III focuses on the role of IP systems in the development of nanotechnology. Three-dimensional (3D) printing – or “additive manufacturing” – technologies differ from traditional molding and casting manufacturing processes in that they build 3D objects by successively creating layers of material on top of each other. Rooted in manufacturing research of the 1980s, 3D printing has evolved into a broad set of technologies that could fundamentally alter production processes in a wide set of technology areas. This report investigates, from the perspective of an intellectual property scholar, how 3D printing technology has developed over the last few decades, how intellectual property rights have shaped this breakthrough innovation and how 3D printing technologies could challenge the intellectual property rights system in the future. Semiconductor technology is at the origin of today’s digital economy. Its contribution to innovation, productivity and economic growth in the past four decades has been extensive. This paper analyzes how this breakthrough technology came about, how it diffused, and what role intellectual property played historically. The development and diffusion of antibiotics contributed to large improvements in human health and living standards. The antibiotic revolution also spawned the modern pharmaceutical industry. This paper reviews the development of the early antibiotics, and the roles of intellectual property rights (in particular, patents) in their development and diffusion. Modern commercial aircraft are complex products that incorporate innovations in technologies ranging from advanced materials to software and electronics. Although commercial aircraft assuredly qualify as a transformative innovation, in fact today’s commercial aircraft are the result of a process of incremental innovation and improvement that dates back more than a century. A great many of these improvements and incremental innovations originated from government-supported R&D programs sponsored by the military services or government research laboratories. The adoption of commercial-aircraft innovations within many industrial economies, including the United States, also has been influenced by government regulation of air transportation. This paper provides a historical characterization of the innovation and record of technical progress in US commercial aircraft during the 1900-1975 period. It identifies the sources of support for innovation and technological adoption, and examines the origins and impacts of “breakthrough innovations” on the overall evolution of the global commercial aircraft industry. The paper also assesses the role of patents in these important innovations. An analysis of new, FDA-approved molecular entities reveals dynamism in terms of new innovation. An assessment of the first patent for each drug reveals that the pharmaceutical industry, particularly large, established companies in North America, tend to dominate the field. Whereas inventors continue to found biotechnology companies at a steady rate, recent trends suggest these inventors more often come from the private sector. This study describes patterns and trends of intellectual property use in Brazil, drawing on a new statistical database (BADEPI). This paper explores the phenomenon of “trademark squatting” – a situation in which someone other than the original brand owner obtains a trademark on a brand. The authors develop a model that shows how squatting results from market uncertainty that leads brand owners to rationally forgo registering trademarks, creating opportunities for squatting. They create an algorithm to identify squatters in the Chilean trademark register and show empirically that squatting is a persistent and systematic phenomenon. Using data on trademark oppositions, the authors find that squatting leads brand owners that have been exposed to squatting to “over-protect” their brands by registering disproportionately many trademarks and covering classes other than those directly related to their products and services. Trademark squatting, therefore, creates a strategic, albeit excessive, response by brand owners which inflates trademark filings. Markets for brands, as defined in this paper, play an important but underappreciated economic role in today’s global economy. The ability to use Market for Brands allows companies to diversify their business; access competences; and generate new revenues without substantial investments. This paper defines and provides a taxonomy for different brand markets then analyzes the economic rationale of such markets. It also assesses the relative importance of the different brand-related transaction types in developed and emerging economies alike. This paper analyzes Chinese patenting abroad by using WIPO’s foreign-oriented patent family dataset and a respective enterprise questionnaire. It finds that by the turn of the century China emerged as major actor in terms of international patenting. While this is changing rapidly, the share of Chinese patents which get filed abroad is still a fraction of total patents filed at home and most patents still also only target one foreign IP office. Chinese foreign-oriented patent families are concentrated in a few technology fields, and a few Chinese firms are responsible for a large share of total Chinese patents filed abroad. This paper describes the emergence of a population of firms specialized in developing and commercializing educational tools and instructional technologies, and discusses whether this trend can be seen as part of the solution to the innovation deficit and cost disease problems in this sector. This paper discusses the state of innovation in the Egyptian information technology sector (IT) and seeks to identify the current and potential role of intellectual property (IP) for this sector as well as the links between IP and innovation and foreign direct investment. The paper proposes IP-related policies which could contribute to promoting domestic innovation. High-skilled immigrants are a very important component of U.S. innovation and entrepreneurship. Studies regarding the impact of immigrants on natives tend to find limited consequences in the short-run, while the results in the long-run are more varied and much less certain. Immigrants in the United States aid business and technology exchanges with their home countries, but the overall effect that the migration has on the home country remains unclear. Little is known about return migration of workers engaged in innovation and entrepreneurship, except that it is rapidly growing in importance. 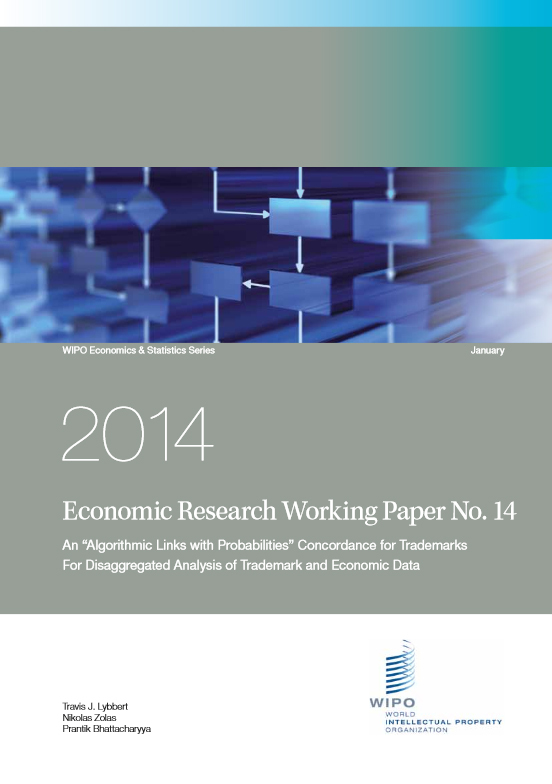 The authors propose an ‘Algorithmic Links with Probabilities’ (ALP) approach to match Trademarks (TMs) data to economic data and enable these data to speak to each other. Specifically, they construct a NICE Class Level concordance that maps TM data into trade and industry categories forward and backward. This concordance allows researchers to analyze differences in TM usage across both economic and TM sectors. In this paper, the authors apply this ALP concordance for TMs to characterize patterns in TM applications across countries, industries, income levels and more. They also use the concordance to investigate some of the key determinants of international technology transfer by comparing bilateral TM applications and bilateral patent applications. The paper looks at brands from an economic point of view. It defines concepts; analyzes the conditions under which brands are long-lived productive assets and contribute to economic growth; and reviews the measurement of investment in brands. It finds that a productive role for brands is consistent with assumptions used in the economic analysis of innovation. Finally it offers an analysis of economic development that suggests branding rises with growth. This paper provides an analysis of global patenting trends using the most comprehensive data currently available. Among other things, it finds that subsequent patent filings – additional filings of the same invention, mostly in additional countries – contributed considerably to the growth in filings worldwide, pointing to globalization as one important driver of filing growth. However, no single factor can fully explain the marked increase in the use of the patent system. This study describes patterns and trends of intellectual property (IP) use in Chile, drawing on a new database containing all patent, trademark, utility model, and design filings received by the Chilean IP office over the period 1991-2010. Among other things, the study offers insights into the drivers of filing growth, the origin of filings, the distribution of applicants, the importance of different applicant types, the share of filings by different economic sectors, the relevance of IP bundles, and the patenting behavior of Chilean applicants overseas. The authors connect concepts, definitions and data regarding the informal economy, innovation, and intellectual property in order to establish a framework for further qualitative and quantitative research and the improvement of public policies in respect of these issues. The goal of this paper is to assess the influence of spatial mobility of knowledge workers on the formation of ties of scientific and industrial collaboration across European regions. Co-location has been traditionally invoked to ease formal collaboration between individuals and firms, since tie formation costs increase with physical distance between partners. In some instances, highly-skilled actors might become mobile and bridge regional networks across separate locations. This paper estimates a fixed effects logit model to ascertain precisely whether there exists a ‘previous co-location premium’ in the formation of networks across European regions. In this paper, the authors describe and explore a new algorithmic approach to constructing concordances between the International Patent Classification (IPC) system and industry classification systems that organize economic data. This ‘Algorithmic Links with Probabilities’ (ALP) approach incorporates text analysis software and keyword extraction programs and applies them to a comprehensive patent dataset. The authors conclude with a discussion on some of the possible applications of the concordance and provide a sample analysis that uses their preferred ALP concordance to analyze international patent flows based on trade patterns. The authors outline the main trends in the growth of disembodied technology trade vis-a-vis international licensing and the trade in research and development and technical services. They show that there is considerable heterogeneity across countries in the form of technology trade that countries specialize in and also suggest these are related to underlying appropriability conditions and intellectual property rights regimes. The authors examine the robustness of research and development (R&D) and productivity relationship in a panel of 16 OECD countries. They control for fifteen productivity determinants predicted by different theoretical models. R&D and human capital emerge robust in all specifications making them universal drivers of productivity across nations. Most other determinants are also significant. Productivity relationships are heterogonous across countries depending on their accumulated stocks of knowledge and human capital. 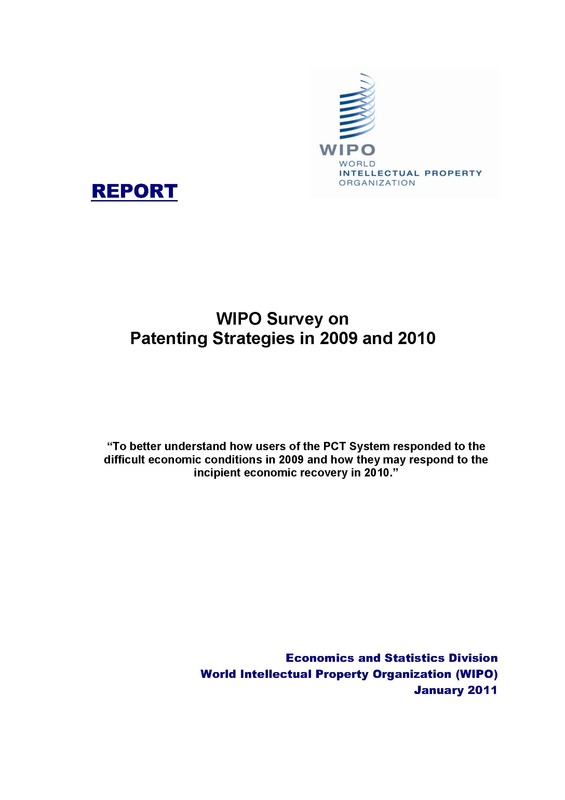 To better understand how users of the PCT System responded to the difficult economic conditions in 2009 and how they may respond to the incipient economic recovery in 2010. The series of papers in this publication were commissioned from renowned international economists from all regions. They review the existing empirical literature on six selected themes relating to the economics of intellectual property, identify the key research questions, point out research gaps and explore possible avenues for future research.